Our land, besieged, is wrought with darkness, yet there is some good to be found as well. The birth of a new Coalition is just one such example, and is the highlight of this week's Spartan Chronicles. Welcome, Germania of Batiatus. We depart this week from the our usual stories of bloodshed, turmoil and grief and delve into something that is more inspiring and highlights the fact that despite the destruction that this land faces, there is still room for growth and renewal. The story I speak of is the birth of a Coalition. From time to time, a leader is born and a new Coalition rises up from the ground, whether it be from the ashes of a battle, a dispute within leadership or simply from a vision one has had. These new Coalitions may one day be noted among the names of the most powerful to grace our realm, or they may simply fizzle out of existence like so many before them. I, personally, am one to hope for the former, not the latter. The promising Coalition that we speak of today is the newly founded Germania of Batiatus, led by one of the former leaders of HoB, one of the most powerful Coalitions currently in the realm. 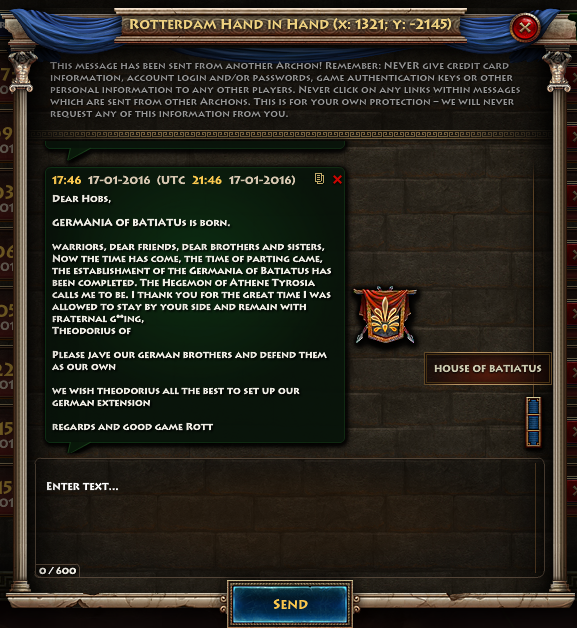 This announcement was made shortly after key members departed HoB and created Germania of Batiatus. This departure was one of general acceptance and brothership, for the new Coalition that was to be formed would be a new brother in arms for HoB and its allies. A separate Coalition making its own choices and decisions, but nevertheless, a strongly connected ally. 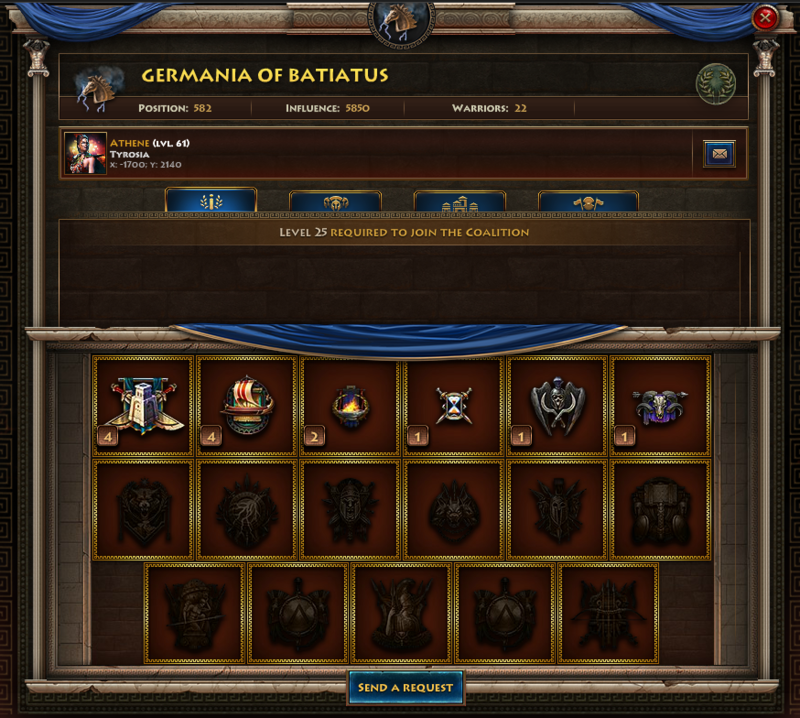 Already, Germania of Batiatus has attracted some high level Bannermen into its ranks, and gained multiple Achievements. This would seem to show that they are quickly heading down the correct path. Although they are headed down the path of success, history has shown that even a small incorrect turn or decision can lead a Coalition to ruin. We at the Spartan Chronicles wish this new Coalition all the success in the world and hope that they will play a pivotal role in the future in the constant battle against Xerxes and his vile minions. Good luck, Germania of Batiatus; it is a grim and ugly world out there. Be ever on your guard, and may Zeus grant you guidance.